this add-on introduces real flowing rivers, with a true current, to TFC. It is also a standalone mod for vanilla Minecraft, but contains special support for TFC worlds. These rivers are generated in the world using custom non-decaying flowing blocks and are much larger than anything the player could create using buckets. They originate in multiple sources and flow down the terrain through slopes and waterfalls, joining together into wider rivers until they reach the sea (or the old-style sea-level static rivers). They are considered fresh water for TFC purposes so you can drink from them, and cattails grow along their banks. Keep in mind this is still an alpha release. Rivers are fairly short and don't always appear in ideal places, but this will improve in time. Please see the FAQ section below for explanations of various known issues, including tips on finding a river. Let me know of any other bugs you encounter or suggestions you may have. The current version of Streams is compatible with TFC 0.79.16+ and requires Forge 10.13.1.1217 or newer and the Farseek API version 1.0.4 or newer. Version history is available along with the file downloads on curse.com. To install, download both Farseek and Streams jars and place them in the "mods" subdirectory of your Minecraft install alongside TFC. (On Windows, that's %APPDATA%/.minecraft/mods.) If upgrading from an earlier version, make sure to delete the old jars. How do I find a river? For a quick demo you can try the seeds and coordinates from the sample pictures. Otherwise besides walking along coastlines, you can use the game log as a shortcut to find rivers. The log file is log/latest.log. (You can also view the console in real time: in the launcher go to "Settings" then turn on "Keep output log when game starts" and use "Filter" at the top left to find "Streams".) Then when you generate a world, look for an entry like "[06:07:42] [server thread/INFO] [streams.world]: River at tp -24 67 -161". This gives you the coordinates of a river, and you can copypaste it as a "tp" teleport command if you're in Creative mode. I find that I get a river on initial world load about half the time, so if you don't get one just keep trying. 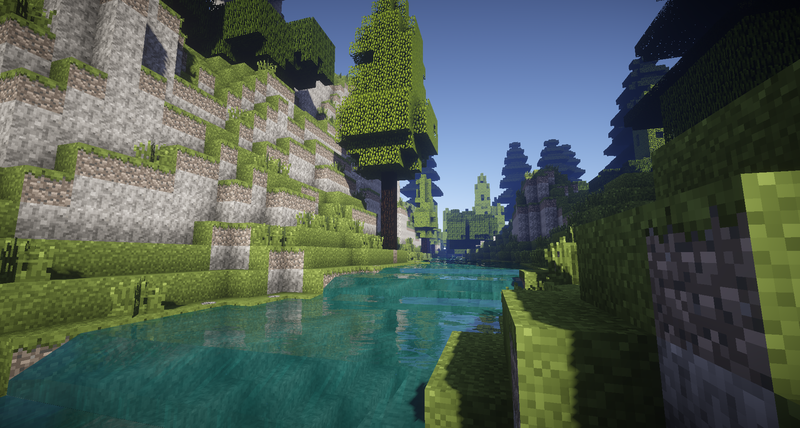 How do I make shaders work with the river blocks? You need to specify the block IDs in your shader configuration. Enable the game log (as explained in the answer above) and look for a message starting with "Shader configuration". There you will find a pre-formatted configuration line to put in the specified config file. The block IDs will also include TFC water blocks, but will change with every combination of mods so make sure you re-check it when adding/removing mods. Does this mod replace the existing static rivers? No, the old-style sea-level no-current rivers are still around. In fact you will often see flowing rivers terminating in those. Can I get rivers in my existing world? Yes, but it probably won't look good. You'll get a patchwork of incomplete river pieces where new and existing chunks meet. You can still do it if say, you're committed to travel far away from your current location, but the mod will warn you to backup your world before proceeding. Streams won't perform the backup for you so make sure you do it! Can I create my own rivers? Not at the moment, as the custom flowing blocks are not available to the player. You can alter the existing ones somewhat by digging the shorelines, the rule being that two river neighbors will combine into a new river block by averaging their currents. However a channel dug away from a river behaves as normal decaying water. Later I might add a special bucket that creates custom flows. Can I boat on the rivers? Sure! Give it a try. If you just drift along you shouldn't reach boat-breaking speed. Note that boats have always been rather buggy and more so with river flows. You may experience some desynchronization. Are there any underground rivers? How about rivers of lava? Rivers do sometimes form tunnels in recent versions although they don't flow below sea level. Lava rivers are all planned for an upcoming update. Why do I sometimes see rivers crossing each other or sources halfway in mid-air? I haven't found out why but I'm working on fixing those. Where is the source code? It is now available on GitHub. Please note that the code is in Scala (not Java) and that most of it will be replaced as part of an upcoming major rewrite. How can I help with the mod? There's many ways! You can give feedback, report bugs, help with profiling performance, post screenshots and videos, or donate through the Paypal button below. All help is greatly appreciated! Since this addon has been specifically altered to work with TFC and the freshwater mechanics, it is completely appropriate and acceptable to be posted in this forum. The one suggestion that I would make would be to switch the console logging to be off by default, and only enabled by config or command. Especially on servers, console spam tends to get really bad, so it's best to keep it clean wherever possible. Looking good! Too bad I already started a new world only a few days ago... but I'll keep this earmarked for the future. This mod looks amazing, but it appears to have conflicts with something else I've yet to isolate. It generates a log file far too large to post in entirety here.Specifically, the log contains a significant amount of the following code repeated. I like this, will try on a single player world. Hope is not too demanding so I can have it in the server. Since this addon has been specifically altered to work with TFC and the freshwater mechanics, it is completely appropriate and acceptable to be posted in this forum. The one suggestion that I would make would be to switch the console logging to be off by default, and only enabled by config or command. Especially on servers, console spam tends to get really bad, so it's best to keep it clean wherever possible. Thanks Kitty! Regarding the server logging, the river coordinates are the mod's only Info-level logging, and even at Debug level there's very little (only at world load/unload I think). So it should be less verbose than Forge itself. This mod looks amazing, but it appears to have conflicts with something else I've yet to isolate. It generates a log file far too large to post in entirety here. It seems there's a conflict with the Player API mod. I added a note in the top post, and will work on fixing this. Oh my gosh. This is amazing. This is something that I've specifically felt TFC was lacking and needed. Djakuta, this is really painful on a server. I tried it last night, although not a great server it runs an unlimited TFC world with 5 people pretty comfortably. As the console announced a river I'd TP to it, and get disconnected. Try again...same thing. Single player was ok, so I just used that to explore. It LOOKS AMAZING, but needs a bit of a performance tweak before it's really usable. This is near the mouth of a rather extensive network of rivers, if people want to see it in action. Rubbish seed though otherwise. - the erosion of the landscape (I assume this is what you do) can be pretty extreme; in the example above there are quite a few 10 block high single thickness remains of mountains! Recommendation: smooth the remaining landscape a little to remove these odd looking pinnacles! - performance... even though the server didn't seem overly loaded, CPU was ok, memory use was ok, it mass-disconnected pretty much every time I TP'd to a river area. 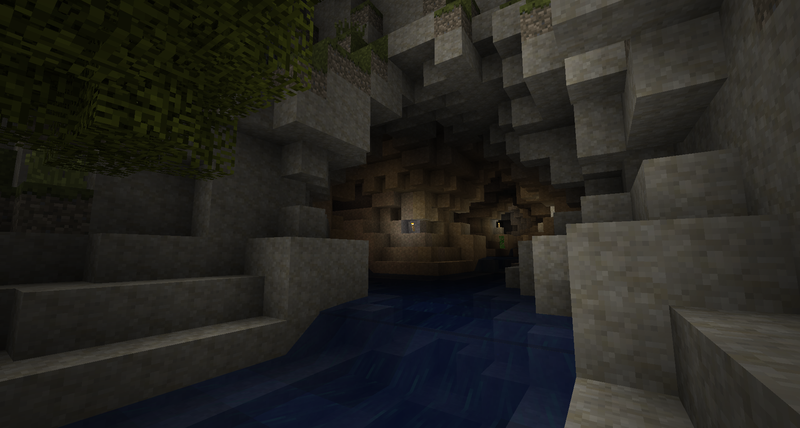 My guess is that the chunk generation somewhere goes crazy. - have I said: it looks AMAZING!! This is something Minecraft is lacking! I have some amazing river based TFC seeds; but flowing, height displaced, "naturally created", eroded rivers... wow. I can't wait to get my teeth into the code, to tweak this up. A new version 0.1.2 is out that fixes the Player API conflict. Please give it a try! Also, many thanks for your feedback Udary. I'm glad you like the general look of the rivers. As you found out generating them has a performance cost, I'm sad to hear that it killed your server. I wonder if walking/flying towards the coordinates would have prevented this, by making the chunks load more gradually? In any case I clearly need to improve performance. The unnatural aspects you describe are due to the rivers being built in separate pieces, like strongholds or mineshafts. They start from the sea (because forks are way easier than joins) and the intention was to have them seek higher terrain as they're laid out. This blind groping about hasn't given me the results I wanted though. I'm designing a brand new algorithm that scraps the notion of structure components and makes them behave much more like flowing water does. There will still be a need for preloading chunks, but I can introduce several optimizations to improve the process. 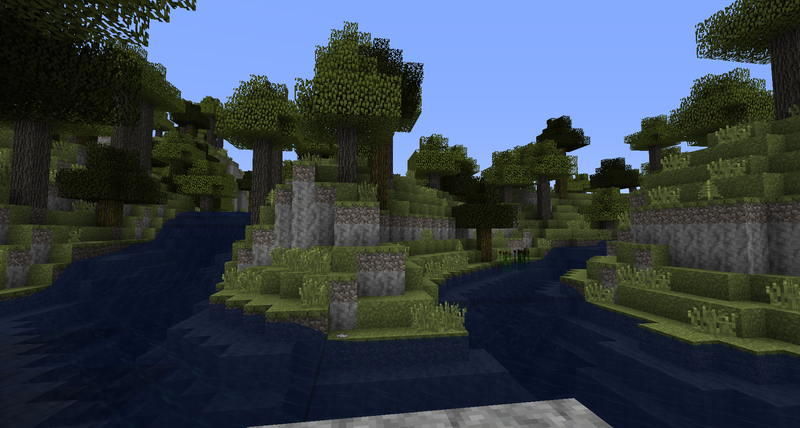 And then I could provide an API for terrain generators to hook into to customize generation. Wouldn't that be nice? Stay tuned for updates. It works fine if you approach on foot, but I was excited to see how they looked, so I TP'd... It's not problem, there was only me and one other online and we were both there to check your rivers out. Mass chunk generation has a serious issue though. Interesting approach to the creation. It's completely the opposite to how I would have approached it... but I get where you're going with it. Water falls would be neat, rather than fully eroded mountains! I should generate the same world without the river mod to see what it should look like....maybe it was a weird area to start with?? I'm very excited to see how this progresses. Your quick response and action to resolve the player api issue is amazing, as well as the mod. It adds the ambiance that terrafirmacraft desperately needs in many locales and breaks the monotony that plagues the plains. The way it naturally carves through terrain and even more mind-blowingly attains deeper believability by flowing throughout its entirety even through the tallest peaks. It's equally charted with small and tall waterfalls that enhance it's aesthetic qualities. Thus, my first experience had been walking upstream alongside a river from its delta. Through a forest, past a tall waterfall coming from a nearby peak where it forked into some rapids. Even further was a poor wolf who had spawned alone atop a rock levitating meters above the river. I broke the block to free him, watching as he helplessly attempted to get to the edge of the river and get himself to safety. Thus he only ended up drifting down the river into the ocean. This mod is humor, beauty, and fun in a fantastically bundled package. This really is a fantastic mod, and perfectly suited for TFCraft. I'm definitely going to enjoy it on our server once the next map reset comes around, and hopefully by then performance is optimized. I did notice the loss of frames while generating new terrain with streams in it, but once they were in place it was smooth sailing. I'm excited to see some of the longer river systems as the mod progresses over time, but for now it was just a great all around experience. Great work! I have one suggestion. Compatibility with the item physics mod. when you throw an item in a river with item phyics it sinks. I would appreciate it if you could make the two compatable! It would make it even MOAR REALISTIC! LocationThe End. No I am *not* an enderman. I just installed this mod for my private 4-person server, and I have to say, the rivers are beautiful. Major thumbs up. I haven't tried yet, but I'm assuming that right-clicking the river with a bucket will yield fresh water. My only complaint (and it is very minor) is that it lags a little bit when generating new terrain. I really like this addon. I think I'll be keeping it. Thanks to everyone for your comments! Keep the feedback coming, this will improve the mod. Regarding fresh water, I expect the rivers to behave as such for all purposes, let me know if you find a counter-case. This reminds me to mention, gold-panning is also possible in the rivers, but only where they visibly go down in elevation (measured in whole blocks, or in fractions of blocks like normal "decaying" water). Ideally it would be possible everywhere but the implementation of gold panning doesn't easily allow this. In any case, digging a side channel works as usual. Tried it on a quick new ssp world. It looks totally amazing in places, you should talk to Dunk and Bioxx and get this implemented as part of TFC itself. I think it could look totally amazing when all the kinks are worked out. This really spices up generated terrain... I find myself interested in exploring parts of terrain that I never would have, like following large river systems through mountainous jungles... Really incredible. Thank you for your work! Thanks everyone for your support and comments! This is much appreciated. An new update is available! Go to the top post to grab version 0.1.3. This version improves boat physics a bit, and outputs block IDs to enable shaders for the river blocks. Note: When loading a world created with Streams 0.1.2 or earlier, Forge will warn you about 48 missing blocks and ask if you want to remove them. You can safely click Yes, as these blocks were registered by accident and never actually used. [*]Improved boat physics in currents so they stay closer to the river center. [*]Fixed RNG issue that caused different river layouts for the same world seed. [*]Added startup printout of water block IDs for shader configuration. [*]Removed unused water blocks (safe to delete from older saves when prompted). Very cool! This mod is so impressive! Can you make it so that fish spawn in rivers? I did catch fish in a flowing stream the other day. It's just the little fish items though - do you mean fish mobs?